Bid farewell to the holidays and enjoy settling into an autumn routine, with tasty packed lunches to keep your spirits up. You can get most of the ingredients from Riverford, delivered straight to your door. We’ve got lunch ideas covered, but you can win a copy of Everyday and Sunday, our latest cook book by sending us your favourite after school recipes. Vintage cheddar, tomatoes and crusty bread* with ploughman’s pickle. 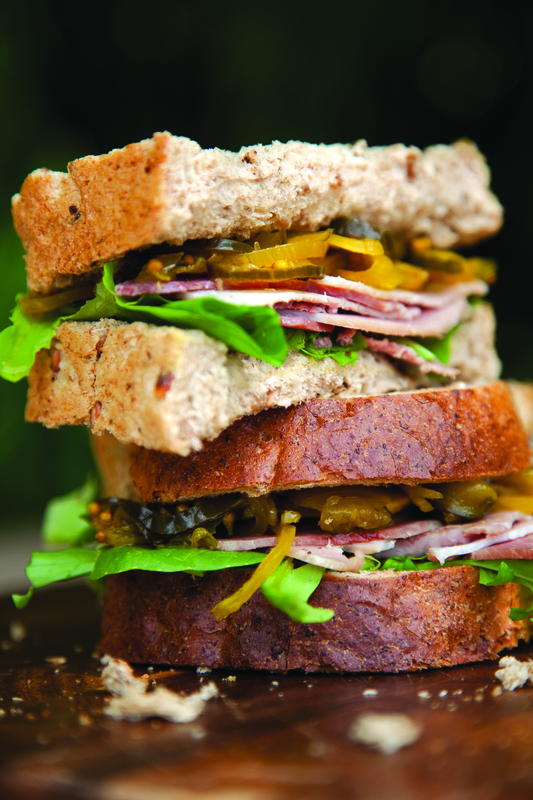 Traditionally cured ham salad sandwich with tangy cucumber pickle (made with our award-winning mini cucumbers!). Make the night before – roast chunks of mixed veg until tender and stir through some pesto. Top with sliced mozzarella in the morning. Buttery pimhill oatcakes with hummus and crunchy crudités. Cook a chopped onion and crushed garlic clove in olive oil until soft. Combine in a bowl with cooked cannellini beans, fresh tomatoes, a handful of chopped sundried tomatoes and black olives, a teaspoon of chopped capers and fresh herbs. Trickle with extra virgin olive oil and lemon juice and season to taste. Serve with mixed salad leaves. *bread not yet available in all areas – we’re working on it! This is our final summer holiday idea this week. 1. Finely grate the rind from the lemons, making sure you don’t grate off any of the bitter white pith. Place it in a heatproof jug with the sugar. 2. Pour over the water and stir until the sugar has dissolved. 3. 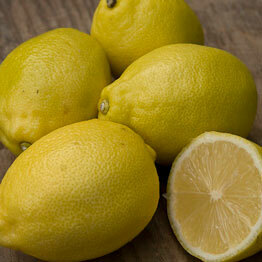 Cut the lemons in half, and squeeze the juice from the lemons (try using a fork to get the last drops out). Strain through a sieve into the jug. Taste, adding a little more sugar if you like. Allow to cool then chill. Serve with ice. Plants need water for photosynthesis. It reaches the leaves through tubes called xylem. Try this activity and see how it happens. 1. 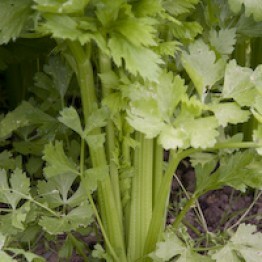 Break off 3 sticks of celery, keeping the leaves on. 2. Put each stick in a glass of water, adding a different colour to each glass. You’ll only need a few drops. 3. Watch and see what happens over the next few days. When you slice through the stem you’ll see the xylem coloured with the food colouring. 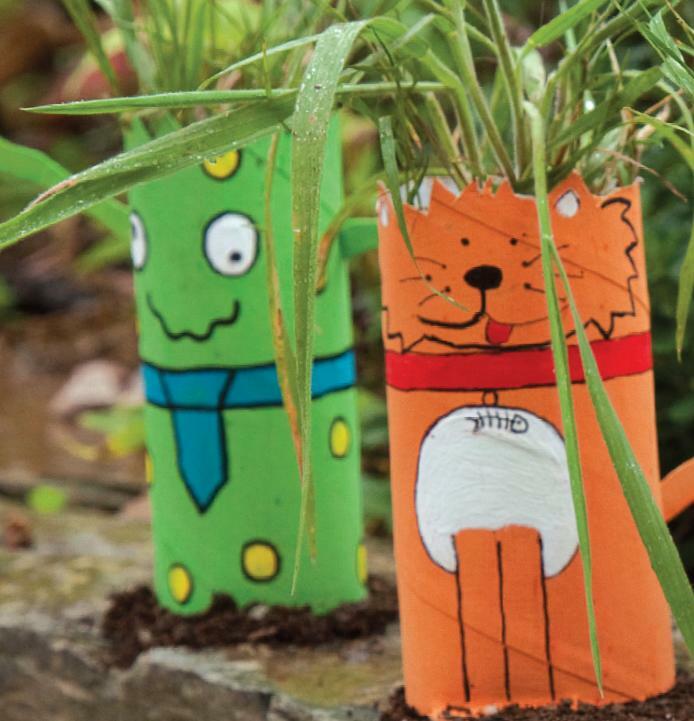 For summer holiday entertainment, try making these creatures out of loo rolls! You can make as many loo roll people or creatures as you like! If you’ve got more than one loo roll saved then why not try making a whole green haired family? The only other thing you’ll need for this project that you might not have at home is grass seed. You could collect some from a local park or a friend’s garden. Or you can use cress seeds. Seeds contain food for the seedling, as it cannot make its own food from the sun (photosynthesis) until it has grown leaves. It is this stored food, which is in the cotyledon (the inner part of the seed), that makes seeds, including nuts, nutritious for animals and humans to eat. 1. Draw a face on the loo roll and then ask an adult to help you cut a section off the bottom, taking care not to squash the tube. You can cut the loo rolls to different heights, but remember, the roots need some room to grow so don’t cut them too short. 2. Stand the tube on a saucer and fill it with compost. Sprinkle some of your seeds on top. 3. Gently sprinkle some water on the seeds. Try not to wet the cardboard so your creature’s face doesn’t run. Use a spray watering bottle, your fingers or a teaspoon. 4. Put the saucer and your cardboard creature on a windowsill so they are in the light. Make sure the seeds do not dry out; you want to keep the soil damp, but no puddles. 5. Be patient – give your seeds anything up to a couple of weeks to germinate. 6. Keep turning the saucer so that your hair doesn’t grow lopsided. 7. Soon you will be ready for a trim! This seasonal favourite is typically harvested from January through to April, when homegrown produce is scarce. It can take some cold weather, and usually, in Devon we would expect 7 or 8 serious frosts every winter. 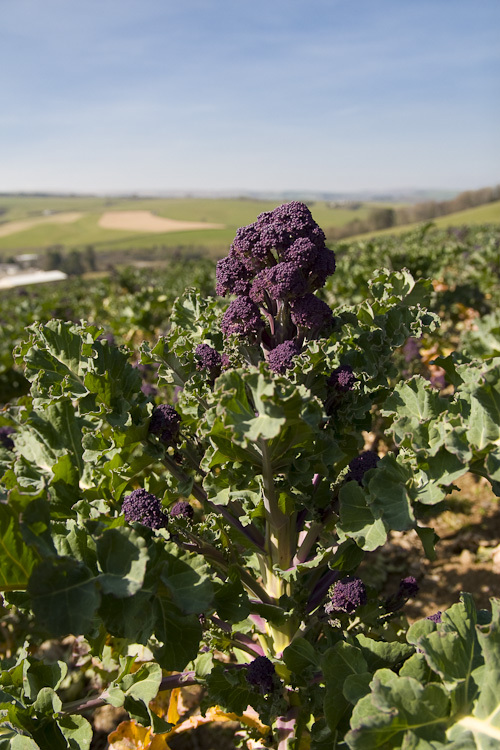 This time, we’ve had 40 heavy frosts already and temperatures have dropped to as low as -16˚C, killing off some varieties of purple sprouting broccoli and stunting the growth of others. Because of that, we’re harvesting later than normal this year. The price won’t be affected as we pay a fixed price to our growers, so the good years cover the bad years. Our box prices are set too. We usually have a glut of cauliflower around this time of year too, but the frost has killed off a lot of them as well. Their outer leaves can take a lot of cold weather, but not as much as we’ve had this winter. Cauliflower grows best on the mild coastal fringes of the country. We now have some starting to come through, from our SDOP grower Peter Wastenage in Budleigh Salteron on the South Devon coast. Throughout December, we’re posting tips, ideas, downloads and recipes on our Facebook page (our version of an advent calendar). 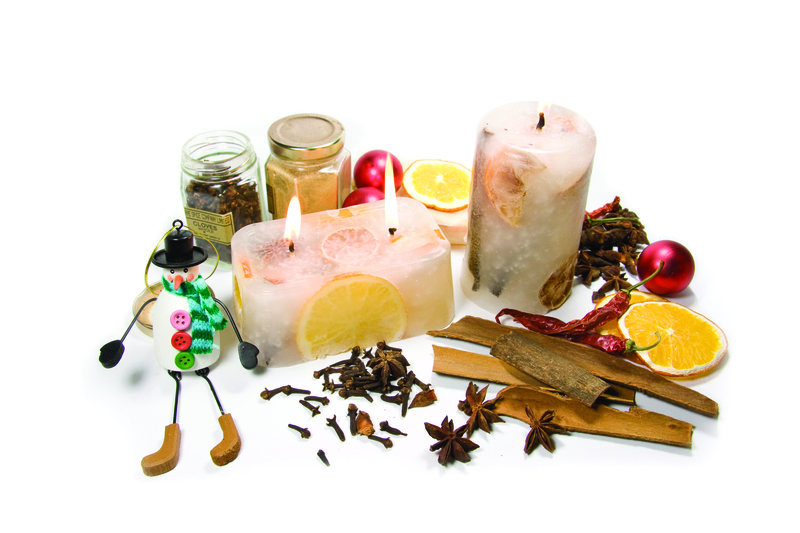 Today we show you how to make citrus candles. These are fun to make, look great and will fill your room with the smell of fruit. Make a hole in the bottom of your mould with the tip of a sharp pencil or some scissors. Thread the wick through the hole, with a bit poking out of the bottom of the mould. Press some Blu-tack around the wick on the outside of the mould – this will stop any wax escaping later. Gently pull the other end of the wick until it’s taut in the middle of the mould. Balance a pencil on the top edges of the mould and wrap the long end of the wick around the pencil. Put the wax and a few drops of essential oil in a heatproof bowl over a pan of water. Heat the water until it simmers and gradually melts the wax. While the wax is melting, arrange the slices of fruit, cinnamon sticks, cloves and star anise in the mould. Pour the melted wax into the mould. Tap the outside of the mould to make any air bubbles rise and disappear to one side. When the wax has cooled down, remove the Blu-tack from the wick, tap the bottom of the mould and pull gently on the other end of the wick attached to the pencil. If the candle doesn’t come out easily place the mould under a running hot tap for a few moments and try again. Despite being widely used in desserts, rhubarb is technically a vegetable; it’s a member of the polygonaceae family and related to sorrel. It has suffered in recent years along with many of Britain’s traditional crops as supermarkets started selling out-of-season produce from around the world. Rhubarb is an excellent crop to grow in Britain, enjoying cool climates and suffering very few pests. At home, it will keep for a week in a plastic bag in the bottom of your fridge, and can still be used after this. It also packs a flavoursome punch at the table. As well as the obvious crumble, enjoy its vibrant colour by swirling stewed rhubarb through creamy yoghurt for a quick breakfast or dessert. Its sharpness works beautifully with meat and fish, too. Order a bundle of rhubarb alongside your vegbox for delivery between 7-19th June and we’ll include a free pack of vanilla pods so you can try our Rhubarb and Vanilla Yoghurt Cake (recipe available on the website). The cake is really quick to make and is good served warm or cold. The carrot bunches on our farm in France were badly beaten up by the weeds and then seriously assaulted by an atrocious spring. The end result is a much lower yield than we had hoped for, with each carrot creeping towards a harvestable size much later than expected. Our own season has also started a couple of weeks late; we had hoped that the first bunches would be ready for the boxes this week, but they just aren’t quite there yet. Rather than harvest when they are too small or jump to buying substandard southern European carrots, we have decided to leave carrots out of the boxes this week. We are confident that the bunches from France, combined with bunches from Graham and Chris, our growers in Norfolk, will satisfy the needs of the boxes next week. By the end of June, with a little rain and some more sunshine, the crop should be racing away, with ample to go round. You will then enjoy bunches in the boxes through to August, when we return to loose carrots for the autumn. As the days turn colder, thoughts turn to warming stews and casseroles full of comforting root veg. 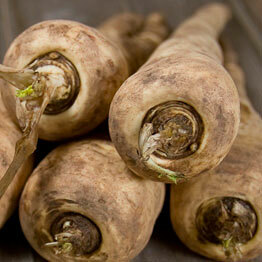 One root you’re bound to find in your box over the coming weeks and months is parsnip. Parsnips are only grown as a significant commercial crop in the UK. The French are particularly dismissive of them and use ‘le panais’ (parsnip) as an insult. But we think they are missing out. Our first crop is often ready by September but we wait until the temperature drops to start harvesting; the cold weather causes some of the starch in the root to convert to sugar, giving fantastic flavour. Parsnips can lose moisture fairly soon after harvesting so we try not to wash them. If you keep some mud on (if you can cope with it) and avoid washing them before storing, you should find that they will keep for a couple of weeks in a cool vegetable rack or the bottom of your fridge. Don’t worry if they go a bit rubbery; it won’t affect the flavour. When you’re ready to eat them, soak the parsnips in water for a few minutes to soften the mud before peeling or scrubbing. Parsnip’s sweet earthy flavour is great in all sorts of dishes. It’s a very good choice for thrifty cooking; add to soups or use to bulk out stews and curries. For a tasty new take on roasted parsnips for your Sunday lunch, parboil them then roll in flour and parmesan before roasting to add extra flavour and crunch. You could also add parsnips to any mixture of other root veg for roasting. Just cut into chunks and put in a roasting tray with hot olive oil, unpeeled garlic cloves and chopped herbs. Season and roast at 180°C for about an hour, turning a couple of times, until tender and slightly caramelised. Another idea is to toss cooked roast parsnips with a little harissa paste and drizzle over some seasoned yoghurt and chopped parsley. If you’re struggling to get children to eat parsnips and other root vegetables, have a go at homemade crisps. Just peel the roots and cut into very thin slices along the lengths. Deep fry in sunflower oil until crisp, drain on kitchen paper and sprinkle with a little salt. If you need more inspiration, there are lots more recipes on the website or you can call us for ideas.